Hamilton Hall has been permanently closed. Hamilton Hall was named after Alma Mary Hamilton, an Assistant Professor of English from 1915-1943. She received the first bachelor’s degree at Illinois State Normal University. 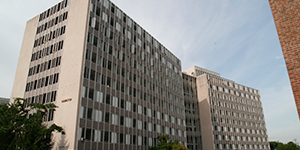 When it opened in 1960, Hamilton Hall was one of the first high-rise dorms on campus.